Simple, classic style - understated yet very much in demand. Ideal for placing by doorways, entrances and gateways or around patios. Supplied as a metallic, gold finished 25cm (10in) diameter plastic pot. 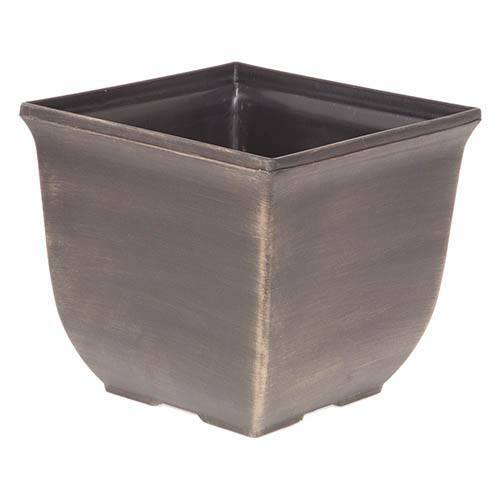 Perfect for adding a touch of class to your garden, this classic Gold Tulipa planter is ideal for filling with your favourite plants to show them off at their best. A contemporary container, the Tulipa planter is perfect for potting up with architectural plants such as box, palms or cordylines, but are equally suited to classic summer bedding displays too. Whatever you decide to plant in it, place by doorways, entrances and gateways or around patios and decking and just watch as they turn heads - but for a fraction of the price of metal or ceramic planters! Plus they're ideal when paired to frame features in your garden. Supplied as a 10in (25cm) width pot. Please note: shade of gold may vary. Supplied as a single pot made from a durable UV-stable and frost-resistant plastic, and hand painted with a gold metallic finish. Please note: shade of gold may vary.